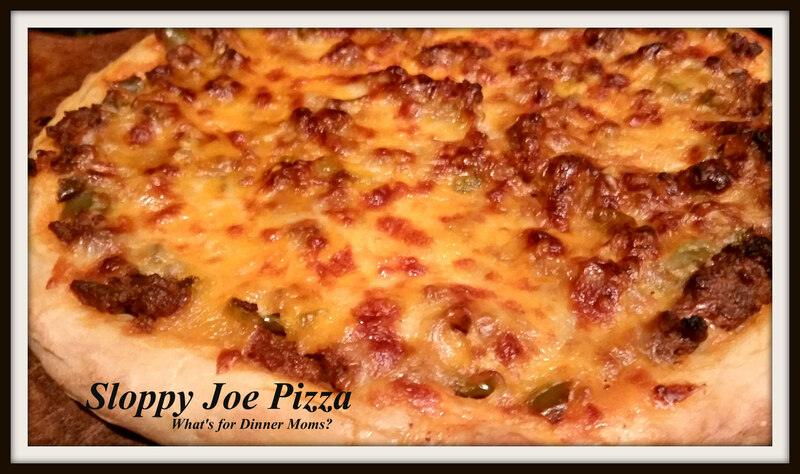 Sloppy Joe Pizza – What's for Dinner Moms? I started mentioning this meal to my family several day before I actually made it. No one said anything but I got “The Look.” The look that says she really has gone too far this time. I love homemade Sloppy Joes but don’t make them very often. A few days ago I really wanted to make them again but was thinking about my Meal Inspiration piece (click for link to post). Take a tried and favorite dish and turn it into something else. This was easy. Instead of putting the loose meat on a roll I put it on a pizza crust! This pizza was delicious! It was very hearty, most of us only had one slice with a salad. The meat was savory and topped with a mixture of shredded cheddar cheese and mozzarella cheese made it taste amazing. You can use a homemade pizza crust, store purchased pre-made crust or a store purchased pizza dough. This makes one extra-large hearty pizza or two smaller ones. In a large skillet cook ground beef over medium heat. Breaking it into small pieces as it cooks. One the meat has cooked through drain off any grease from the pan. Add green pepper and onion to pan and stir well. Add water, ketchup, garlic, brown sugar (if desired), chili powder, dry mustard, Worcestershire sauce, salt and pepper. Stir well and cover cooking for 20 minutes on medium-low heat. Taste and adjust spices to suit your tastes. Roll pizza dough onto greased pan or pizza stone. Heat oven to 425 degrees. Bake crust (if raw) for 5 minutes to set. Add meat to top of pizza. Top with a mixture of cheddar cheese and mozzarella. Bake 8-12 minutes until cheese is browning on top and crust is golden. Allow pizza to rest 5 minutes before cutting. Yes! You really think I’ll eat ” that”? Oh My boys would love this!! I’m gonna have to whip one up. Thanks!! If you have a favorite Sloppy Joe recipe you can use that too! Sounds delicious! I need to try this. Thanks! My kids really liked it. Archived ! Your recipes are so simple, but I can taste the goodness. Tanks for the cooking ideas. Wow what a fantastic idea! It looks mouth-watering. Yes! Make it how you like it. Add whatever ingredients you like and leave out those you don’t. Always my motto. Thank you. We loved it! Yay!!! Looks tasty and sounds YUMMY!!! my stomach. It’s growling just looking at this! Thanks! I hope it is in a good way!